The Russian bug has really got me. A couple of weekends ago we saw Mikhail Bulgakov’s play The White Guard (1926) in a new version by Andrew Upton performed at the Sydney Theatre. 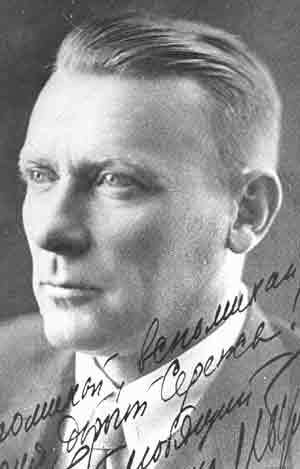 Bulgakov is also the author of The Master and Margarita (1967) the novel it seems all Russians know, a piece of magical writing where Satan – in various forms, sometimes a cat – stalks 1930s Moscow. Still, I read it with great pleasure and will re-read it. Stalin saw Bulgakov’s play The White Guard on 15 occasions and appeared to baptise Bulgakov with his support. But Bulgakov’s work in Moscow theatre dried up and he started to grumble. He had the unnerving experience of receiving a phone call from General-Secretary Stalin with the opening line, “I hear you are not happy with us.” At that point he might have fainted. But he survived the Great Purges and wrote The Master and Margarita, only published in 1967, after his death. You can visit Bulgakov’s house museum in Moscow. It was an energetic production of his play and I was grateful that Upton and Cate Blanchett, artistic directors of the Sydney Theatre Company, had chosen it at as one of the European works in their current season. From the Gleebooks stand in the foyer I bought a boxed set of television versions of Chekov plays. We were enormously taken by the 1970s production of Three Sisters, the play Chekhov wrote in 1900. It is the best production of the several we have seen of this wistfully sad evocation of what were to be the last days of the Russian gentry. Olga, Masha and Irina Prozorova and their brother Andrei are together in their large family house in somewhat attenuated circumstances since the death one year earlier of their father, a general in the army. The house fills with visiting army officers from the local detachment. In bursts of conversation with one another and the men in uniform the women’s disaffection with life positively steams off them. I even forget what she looked like. I suppose people will forget us. We must work. The reason we are depressed is we are the children of parents who despised work. Being trapped is a motif, as in Vanya. Masha is trapped in a failed marriage with a tedious uniformed village schoolmaster; Olga is trapped in her job as school teacher; and their brother Andrei, played here by an astonishingly youthful Anthony Hopkins, is trapped with a wife who ends up tyrannising him and his gentle, passive, sisters. “Nothing ever happens as we want it too. I never wanted to be a headmistress. We shall never go to Moscow,” laments Olga. The appeal of the play lies in the talk. “Since we can’t have any tea let’s do a little philosophising,” says Vershinin, the officer who is new to the town, himself trapped in a marriage with a neurotic wife who regularly attempts suicide and who captivates Masha with his speculations. All this has a sinister foreboding. We know the fate that was to overtake these gentlefolk when the Leninists in their belted blouses, cloth caps and revolvers were to come to town to eliminate class enemies. Indeed – this is Chekhov at his most haunting – someone refers to a “storm coming.” Remember this in a play, set inRussia, written in 1900: they refer to the “coming clap of thunder.” If they knew of the tortures being refined for them, Solzhenitsyn was to wonder about Chekhov’s characters, surely they would kill themselves. What’s the point of knowing a foreign language in a town like this? Futility runs through all the talk and Chekhov seems cast as a precursor to Samuel Beckett and existentialists. Nothing is worthwhile, all effort is wasted. Nothing in the country works; after all, this is a place where the railway station is 15 miles from the town and where no one will succeed at anything. Andrei, who aspired with the support of three doting sisters to be a brilliant academic, becomes the biggest failure, ending up the dullest of provincials, proud to be on the local council and losing what’s left of the family inheritance at card games. …wondering what people years off in the future will think of them, if they will think of them at all. I’ll report on the other plays as I play them. 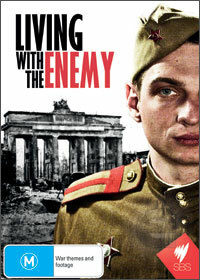 The documentary deals with a period I find fascinating, the immediate post-war years in Germany. The country surrendered in May 1945, demolished, devastated, defeated. But within 10 years the basic reconstruction was finished and within another 15 years it had grown rich on high-quality manufactured exports. The years 1945 to 1949, dealt with on this DVD, were the basis for the miracle. The documentary tells the story through interviews with German civilians and military survivors, and veterans of the Western armies who occupied the land and grew to appreciate its people. There are also good re-enactments. But the best is probably the newsreel footage – for example, of the first Leipzig Trade Fair in the spring of1946, of the first reopened rail that ran from central Berlin to the lakes, of a double amputee hauling himself up a ladder to work on roof repairs. There are miners and factory workers in 1946 demonstrating outside the town hall in Essen for more coal and more food from the British occupiers. And an interview with the communist agitator who helped organize them. There is coverage of Communist show trials of textile factory owners in Leipzig. Honestly, I could watch 10 or 20 episodes of this. 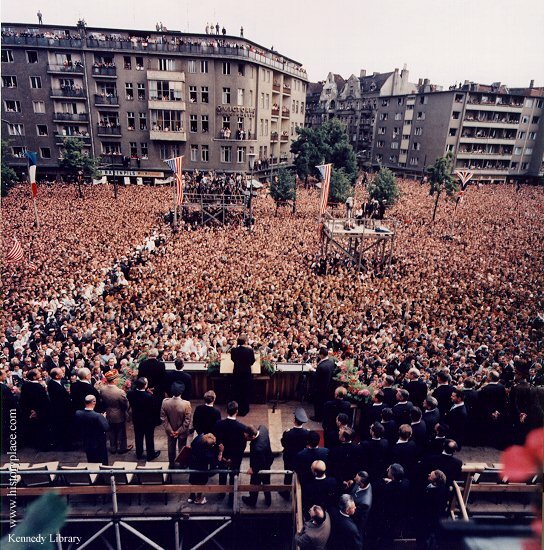 It is a drama of recovery and resilience and an account of the political movements that lead in 1949 to the declaration of two states, the Federal Republic of Germany in the West and the German Democratic Republic in the East. What emerges is, yes, the sheer resilience and ingenuity and doggedness of the Germans. Millions of refugees flowed into a ravaged country as the German populations of the East were forced out. Millions of their servicemen were still held in POW camps. Much of the housing stock had been destroyed. The Russians insisted on hauling factory machinery out of the country and into their own, where it rotted unused. The one Russian interviewee, a newspaper reporter (one fault of the documentary is that there aren’t more Russians) speaks of his unbounded admiration for the German people in surviving this time. Almost immediately, he said, they got water flowing through pipes, trams back on tracks, telephones functioning. There are interviews with adults who as kids lost their parents and were allocated to other families for Christmas celebrations before being returned to the makeshift orphanages. One woman tells how she lost two brothers – one went down with his U-boat the other just vanished and had to be declared dead – but she proceeded to set up a business making shoes out of hemp when there was no leather or rubber. The Germans kept bleeding. Those held as POWs by the Russians were not to be returned until 1955, if they survived the Gulag. In the East, the Communist dictatorship revived Buchenwald and Sachsenhausen, inflicting conditions as terrible on their prisoners as those inflicted by the Nazis. No doubt there are documentaries made in Germany that give us a fuller picture. But we will never see them given the absence of a serious documentary or history channel on cable TV that will purchase them, stick on subtitles and treat us as intelligent viewers. Instead our History Channel gives extraterrestrials and Andre Rieu. In the meantime if this subject interests you as much as it does me, get hold of this DVD. The grainy black and white newsreel footage is living history. One thing from the start. 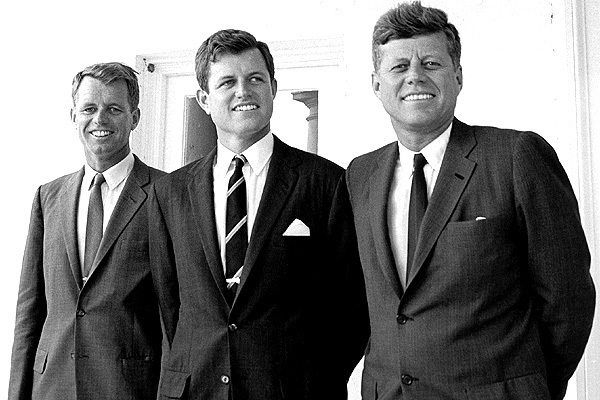 This is not to be confused with the miniseries The Kennedys, which the History Channel rejected. Like its documentary on Nixon, this brings very interesting talking-heads to the screen, first and foremost Ted Kennedy. Touching to have the Lion of the Senate talk about what “my brother” did and thought. There is Hugh Sidey, the TIME magazine correspondent and confidant of the President, and Robert McNamara, who seems an old acquaintance because of his own extraordinary documentary The Fog of War. There is Ted Sorenson, Special Counsellor to the President, and Arthur Schlesinger Jnr, both devotees and high priests of the Kennedy mission. Fascinating is Khrushchev’s foreign policy advisor, especially on the Vienna Summit. And the Social Democratic German politician Egon Bahr talks about the great Berlin speech and about the impact on Berliners of the assassination. So the human material in the documentary is substantial and it is a thrill to have these big faces on the screen talk as if in your lounge room. But as Hugh Sidey said in respect to the President’s illnesses, “For Kennedy, every day was a gift.” And historian-journalist Richard Reeves makes the point that for Kennedy life was a race against boredom. And the tapes of his crisis meetings apparently confirmed his full lucidity. Vital to an understanding of his Presidency is the widespread belief there would be nuclear exchange. Tapes during these two crises over Cuba confirmed, in one historian’s view, that Kennedy was ahead of everyone else in the room. He knew what was going on; his thinking was completely lucid. The historian adds interestingly that he was poorly served by his staff. Robert McNamara says – as in The Fog of War – that in the Missile Crisis war was avoided by a hair’s breadth. But, not to miss the point, it was Kennedy’s experiences in the Bay of Pigs which made him disbelieve his military. And the most recent tapes confirm this. I believe this President therefore has a claim on greatness. To put it bluntly he saved us from war when – who knows – another President might have been nagged by his military into accepting the inevitability of war. Kennedy gave a great speech on June 10 1963, known as the “peace speech”, in which he made a case for the ending of the Cold War. This was no idle rhetoric because in September 1963 he negotiated and sold to the Senate the first significant arms control measure of the Cold War: the Atmospheric Nuclear Test Ban Treaty. It’s the view of this documentary that he was moving to detente. The floundering was at the tactical level, for example, with Vietnam. And there are even a few who say that it is true that Communism is an evil system, but it permits us to make economic progress. Lass’ sie nach Berlin kommen. Let them come to Berlin. The documentary does not ignore the Judith Campbell affair. It comes down with the view that Jack and Jackie did consider separation while they were in the White House. Hugh Sidey states the view that scandals would have broken in a second term. That is, that Judith Campbell or Mary Meyer would have been examined by the Congress and the media because they were not just affairs, but affairs with national security or law and order implications. The documentary establishes that there were two years of protests before President Kennedy announced a civil rights bill. As a recent book argues, he and his brothers were “bystanders” as blacks themselves campaigned in the American South against their second-class status. But after viewing this I’m left with two impressions. First, he was in fact a peace maker who kept us away form a nuclear exchange. And, second, he grew as President. He was the civilian leader laying down strategy in a room with empty headed military brass. We needed him. McNamara ends up saying had he lived the world would have been a different place, and a better one. 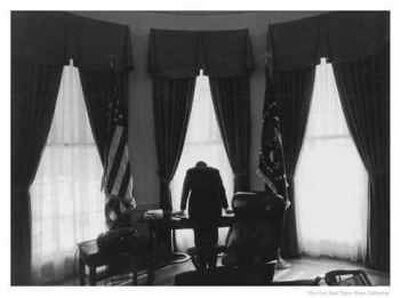 But that’s based on the problematical expectation – one supported by only faint evidence- that he would have wrapped up the American endeavour in Vietnam had he got a second term. Oh, that we were denied that possibility. It’s worth it for the frequent close-up interviews with General Alexander Haig, who ended up Nixon’s final days Chief of Staff (1973-74). Haig was later to sully his reputation when he became incoherent with panic after the attempted assassination of Ronald Reagan in 1981 when he was Reagan’s Secretary of State. But here – talking about Nixon – he is surprisingly articulate and persuasive. Kissinger is there of course, talking about the tragedy of Nixon: that he destroyed himself as much as he was destroyed by “pitiless enemies.” Ben Bradlee, Managing Editor of the Washington Post and Richard Reeves, author of books on American politics are helpful. And there is Monica Crowley, who was his researcher on foreign policy while he was in retirement and who wrote a short memoir of her time with him. 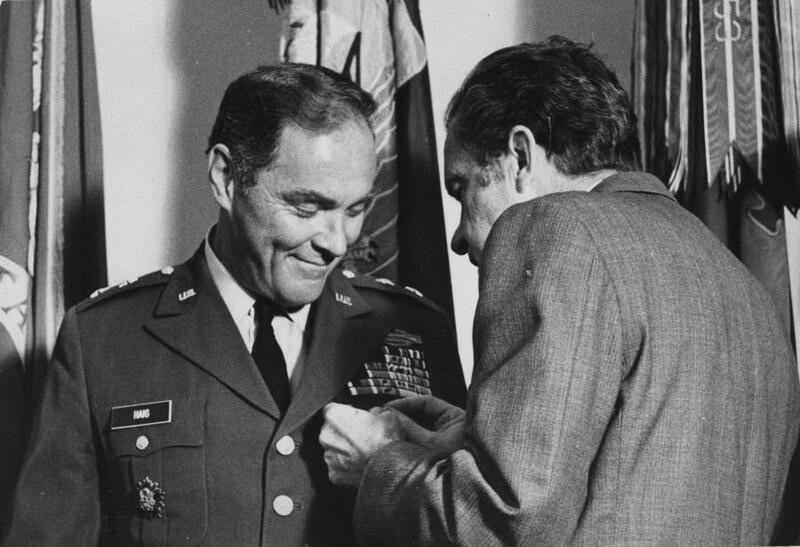 Nixon pinning a medal on Alexander Haig. One mystery of the Nixon Presidency is that of the tapes. First, that he ever took such a risk. Second, that he had not realised the risk as Watergate gathered pace shortly after his second Inauguration of January 1973 and realising the danger, had them obliterated. It is dealt with in full. The documentary is sound because of the people interviewed but, because of time constraints, doesn’t give us the depth we might want. For example, there is the newsreel coverage of the 1972 visit to China. There is none of the more recent revisionist material that criticises the diplomatic strategy and paints the American team as willing to do anything to keep Mao and Zhou Enlai positive, all for the pressing political advantage Nixon was achieving domestically. I screwed it up and I paid the price. It reminds us that Nixon was always on the look out for petty frauds and dirty tricks. When he heard that, in the lead up to the 1972 campaign, theAlabamapolitician George Wallace had been shot, he beamed with satisfaction. Wallace was not going to be able to run as an independent and take Republican votes. His next thought was to plant Democrat election material in the apartment of the would-be assassin. This would have been done, but the apartment had already been sealed by the FBI. There is brief attention paid to modernising impulses in the Nixon administration, like establishment of the Environmental Protection Agency. But no examination of Nixon’s exploitation of race prejudice in the South as the deliberate building of a new political coalition. But this is a 90 minute documentary, not a book, and you watch it for the nostalgia, the black and white imagery of the politics of the 50s and 60s, the faces and the words of the participants – all of which send you back to the books with a renewed relish. The political groupie should pursue the box set entitled The Rise and Fall of Margaret Thatcher: The Collection. It has two discs, one called “The Long Walk to Finchley”, which details Thatcher’s 10 year pursuit of a pre-selection – inspirational wa tching for any young political activist in that hardest phase of a political career, locating a seat. A lot of atmosphere out of the 1950s with the old Tory party receiving a satirical rub; a deft portrayal of the young Ted Heath, in one scene, Margaret appears to try to seduce him. It concludes with her arrival in the Commons.Disc two recreates her final days in power with flashbacks to her defeat of Heath for the Tory leadership and her 1979 election victory against “Sunny Jim” Callaghan. All in all, two of the best documentary drama treatments of politics. The Financial Times listed Paolo Sorrentino’s Il Divo as one of the best films on politics ever made. It is a lively recreation of the political crisis in Italy that erupted around the figure of Giulio Andreotti, Christian Democrat Prime Minister and an unsuccessful candidate for the Presidency. Delicious insights into Italian politics: Andreotti was a faction leader within the Christian Democratic union haunted by his failure to rescue a much admired colleague Aldo Moro who was kidnapped by the Red Brigades – the guilt hangs over Andreotti as he battles allegations about links to the mafia. He battled and survived, winning on appeal against a magistrate’s sentence on two occasions. I’m told by an Italian churchman that Andreotti’s conversations were mesmerising. The New York Review of Books saw fit to run an article on The Red Riding Trilogy, a British police drama with separate episodes located in 1974, 1980 and 1983. I would compare it with The Sting except for its multilayered complexity. It suggests a link between corrupt senior police and a land developer that, in turn, involves a serial killer. The plot takes liberties which in the final analysis makes it fall short of much of the praise it received. On atmosphere, however, it rates very well. 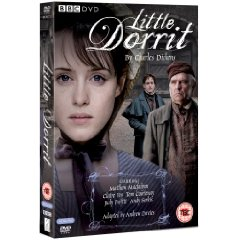 I doubt if we could ever see Dickens on the screen better than the four discs of Little Dorrit with a running time of eight hours and 19 minutes, colossal achievement of the BBC. I could go back and home in on any one of 100 scenes to appreciate this craft.